“I’m still a fan of smooth jazz and when I like something, I really like it. I get as excited about new music as when I was 3½. I feel fortunate that I haven’t gotten so jaded. Some musicians get really jaded and they lose that excitement, and I’ve never lost it,” states Jay Rowe in a comprehensive feature at www.smoothviews.com. It's a sad time when musicians have to defend the genre which is financing their musical jobs. Instrumental music would be a nameless area if this term wouldn't be invented. Jay has released three solo CDs: The Dream I Had (1994), Jay Walking (1997), and Laugh Out Loud (2001). Mainly he is touring the world with Marion Meadows, Ken Navarro, and Chieli Minucci (Special EFX). On his new album "Red, Hot & Smooth" he assembles anew an illustrious circle of first-class artists like Gary Grainger (bass), Andre "Blues" Webb (drums), Kevin Prince (percussion), Ken Navarro (guitars), Rohn Lawrence (guitars), Bill Holloman (sax) and Timi Maia (lead vocal). We jump directly into smooth jazz life with Bumpin' On Hollywood. A tune filled with joy and happiness. The upright melody is catching your attention with the first note. Jay's twirling piano running supported by Bill Holloman's sax and trumpets are really electrifying. Red, Hot & Smooth is a relaxed sophisticated tune. The melody is Jay's starting point for his jazz improvisation. Rohn Lawrence shines through with his remarkable guitar sound. I love his albums "Hanging On A String" and "See You Around". Rohn Lawrence's new CD due to be released this fall. Hopefully! On East Coast West Coast Jay Rowe is defining a clear melody which a captivating character. I always love his jazz excursions showing up his great talent as piano player. I cannot get enough of this! Kristen's Rainbow is dedicated to Jay's sister Kristen. A swinging solo piano piece telling us his story. His nephew Bryan Begley also got his own special Bryan's Song. Ken Navarro steps into the song with his acoustic guitar. Jay isn't only a professional player but also an excellent composer and arranger. Superb! How can a musician grace his beloved wife? Right! By dedicating a song to her. Stars In Her Eyes is Jay's homage to Deborah. Rohn Lawrence's guitar is the cream of the crop. It's the time of melancholy and sweet memory when we reached The End Of The Summer. Jay perfectly incorporates these feelings and mood in his tune. Ken Navarro's guitar and Bill Holloman's trumpet are a splendid underlining. Everyone Loves Mia is dedicated to Jay's mother Mia. A sentimental tune with a great emotional potential. Time To Go Home is a real piano gemm. Just sit back and enjoy! You Make My Life Complete is featuring the singer Timmy Maia. You may recognize the voice from the hit single "I Give My All To You" by The Chris Geith Group. He is performing with Phil Perry, Chris Davis and Surface's Bernard Jackson. You will also hear him on Rohn's upcoming album. A wonderful voice, an awesome tune. 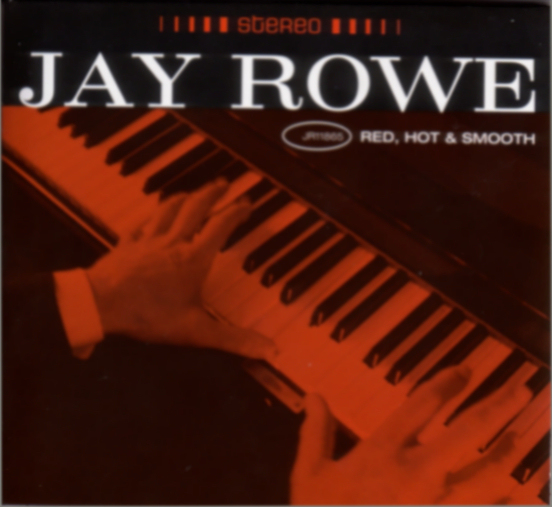 Jay Rowe's new album "Red, Hot & Smooth is music for the contemplative hours. You should spend some time to revel in Jay's genius. No background music at all.